I’m Dr. Jason Attaman. I’m double board certified in the specialty of physical medicine and rehabilitation, and the sub specialty of pain medicine and interventional pain management. Oftentimes I see patients that come to me that have been told repeatedly by multiple doctors that they just have to live with their pain, that there’s nothing else that can be done. But in reality, the issue is that they have not had the resources for the proper treatment. The doctors that I had had experience with, a lot of them their only solution for me was to medicate me. And I actually had one doctor tell me that I can’t fix you. All I can do is just prescribe pain medication for you. And I’m still young, and I want to live my life and not be on medication forever, so it was exciting to come to Dr. Attaman and learn from the very first appointment that his goal was to get rid of the pain and to get rid of the medicine as well. So that I could go on living my life free of all of that. The most important thing I can offer a patient is hope. Most of the people that come see me have suffered for years with their pain, sometimes decades. And they’ve been repeatedly told that there’s nothing left to be done, that they have to live with their pain, or even that they’re imagining their pain. Ninety-nine percent of the time there are treatments available for people with chronic pain that have never been offered to them. And I pride myself on finding those options for the patient. I really want them to leave the office with a sense of hope. One of the things that I strive for is to be able to give patients the whole continuum of treatment options for their pain. And that’s what differentiates me and my clinic from other locations, or other physicians. When I came to see Dr. Attaman he definitely gave me treatment choices that I had not previously been offered. That is my role as a specialist, is to understand these nuances and try to come up with a different angle to treating the patient. When patients come to me for the first time for an initial consultation, I do a very thorough review of their past medical treatments, their imaging reports, any studies they’ve had done, notes from the previous physicians, and I try to take a very comprehensive history from the patient. I need to understand how my patient is suffering because people perceive pain in different fashions. It affects their lives differently. He’s always kind. The entire staff is amazing and I feel like now they’re my second family. We treat patients with what’s called a multi-disciplinary approach, which means I, as the physician, will diagnose and order specific treatments for the patient for the best outcome. And that is variable but it can include pain psychology, where we work with PhD level psychologists who specializes in pain. Physical therapists who help reeducate the patient with range of motions. Injections, which help reduce pain. Manipulation, which sometimes works sufficiently on it’s own or needs a team approach. He was willing to try more advanced treatments that definitely weren’t offered to me by other doctors. And by doing those procedures I was able to get rid of my pain. 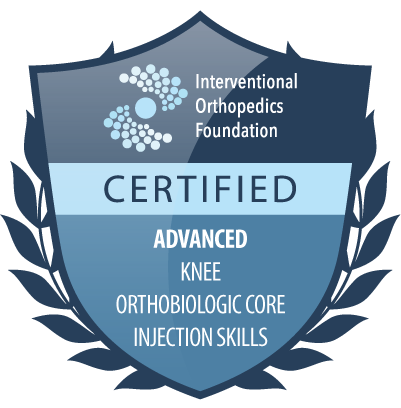 The bottom line is that we tailor the approach and the treatment plan for the specific patient. So when a patient comes to me I don’t see them as a herniated disc, I don’t see them as an amputee. I see them as a person experiencing, and suffering from, a certain type of pathology. And each person requires an individualized treatment. Before I started seeing Dr. Attaman my pain level was between an eight and a nine on a scale of 10. And I was not able to physically do normal daily activities. And after coming to Dr. Attaman, my pain now is about 95% gone. One of the greatest things in my life has been to see patients that have been incapacitated by their pain get back to their life. Even if it’s not in full. Even if it’s some sort of small aspect of their life that they had lost. And, oftentimes, we have patients that have even more dramatic recovery. Climbing to the top of mountains, or getting out of wheelchairs. When I was experiencing pain, I was not able to do normal daily functions such as unloading the dishwasher, going up and down the stairs in my home. Now, to go from feeling like I have no life and no hope and that this was what it was going to be, to being able to do things like– I never thought I would be excited about unloading the dishwasher, or doing laundry, or going up and down the stairs. But it’s been amazing to have my life back. I really enjoy my profession because I get to allow patients to enjoy their life better. I’m a quality of life physician. I don’t necessarily save lives too often, but I save quality of lives. And that brings me a lot of personal satisfaction. REQUEST A CLINIC APPOINTMENTDr. 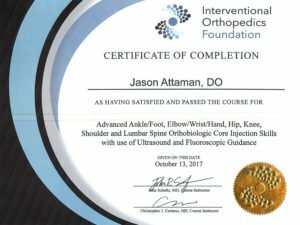 Jason Attaman is a double-board-certified pain management and spine physician with clinics in Bellevue, Seattle, and Auburn, WA. He treats the full spectrum of pain, whether your pain resides in your ankle, foot, elbow, wrist, hand, hip, knee, shoulder, spine, or elsewhere. Dr. Attaman's treatments include stem cell therapy , surgical, and many non-surgical procedures. Call us at 206-395-4422 (Seattle) or 425-247-3359 (Bellevue). Request an appointment in clinic, or book a telemedicine appointment. Considering stem cell therapy? Visit our separate stem cell site. We offer treatment options for the elbow, foot & ankle, hand & wrist, hip, knee, shoulder, & spine. Dr. Attaman is certified at the highest level by the Interventional Orthopedics Foundation for advanced ankle/foot, elbow/wrist/hand, hip, knee, shoulder, and lumbar spine orthobiologic core injection skills with use of ultrasound and fluoroscopic guidance. 1Dr. Attaman is a sub specialist Pain Medicine physician who is Anesthesiology fellowship-trained and Physical Medicine & Rehabilitation residency trained. He is double board certified by the American Board of Medical Specialties. 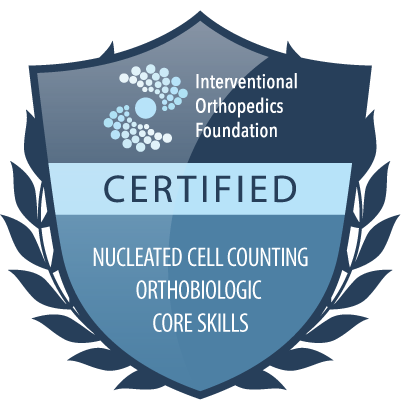 It takes a minimum of 13 years of higher education to become ABMS certified in Pain Medicine. Pain relief is the focus of Dr. Attaman’s career. 2Dr. Attaman “thinks outside the box.” He is a diagnostician first and foremost. He takes great pride in the art of the physical exam and finding the proper diagnosis before starting treatment. 3At most pain clinics, you will only be seen by Physician Assistants and Nurse Practitioners. You may never even meet a physician. Pain management is complex and it is not appropriate for you to be treated by anybody other than a board certified subspecialist physician. Dr. Attaman personally performs all clinic visits and procedures. 4Dr. Attaman specializes in advanced injections to help reduce or eliminate pain. He is an expert in minimally invasive pain management. All procedures are performed under X-ray or ultrasound guidance for best safety and efficacy. Image guidance means fewer injections and faster pain relief. Intravenous sedation is available for your comfort. He uses the most advanced conventional procedures as well as the best of alternative medicine to treat you as as comprehensively as possible. 5Dr. Attaman works with the full spectrum of pain, from the weekend-warrior ankle sprain to terminal cancer pain. His patients range in age from 13 to 102 years old. He treats pain issues from head to toe. He is expert in spine pain, nerve pain, joint pain. In most cases, he can offer appropriate and efficacious treatments for even the most complex pain syndrome. If your doctors have told you that you have to learn to “live with your pain” and that “there is nothing else to be done,” Dr. Attaman can usually help.